The beach at Honoliʻi is composed primarily of black detrital sand and pebbles that have been eroded from areas mauka and transported makai by HonoliʻI Stream. Liberally mixed in with the sand are tiny quartz-like particles that sparkle in the sun and a considerable amount of well-rounded pieces of beach glass. At the northern end of the beach, where the stream meets the sea, ʻiliʻili dominates and forms a partial barrier between the ocean and a very large pond at the stream mouth. The pond provides an excellent swimming area, especially for the little children, but it is deep and drops off very abruptly. The pond is also popular with thrownet and shoreline fishermen. The surf at Honoliʻi breaks directly offshore of the beach over a bottom strewn with boulders. Rip currents and longshore currents are common and are particularly strong when they combine with the cold waters discharged by Honoliʻi Stream. The nearshore ocean bottom drops quickly to overhead depths, and so recreational swimming there is not common. The area is frequented primarily by surfers who ride not only the waves offshore of the beach, but also a break outside the northern point of the bay. Others using the beach are sunbathers and fishermen, and spectators often line the road above the beach to watch the surfing activity directly below. 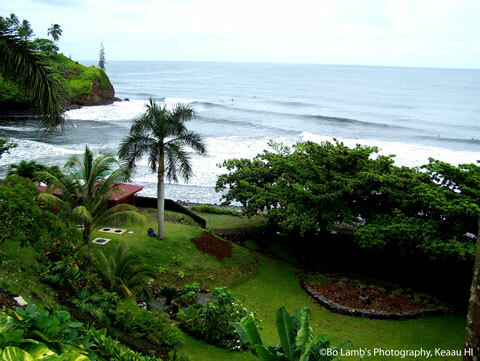 Honoliʻi is one of the most popular surfing breaks in the Hilo area. Honoliʻi Beach Park can be reached by turning off the Belt Highway at Nahala Street in the ʻAlae subdivision or by turning mauka at Paukaʻa and following the old road. Facilities include restrooms, showers, roadside parking, and a paved path from the road down the bluff to the beach. From the time they were built, the park facilities have been the victims of almost constant vandalism; so the plumbing fixtures are often broken or non-operational. Two small pockets of black sand are located between Honoliʻi Beach Park and Hilo Bay. The first lies below the Wainaku Sugar Mill, a very imposing structure with its massive, fortress-like, rock retaining wall. The beach is composed of an interesting variety of materials including boulders, pebbles, black, red, and tan sand grains, olivines, beach glass, driftwood, and other debris. The second small beach along this reach lies below the highway bridge at Piikihae and consists primarily of black sand with a sprinkling of olivines and beach glass. Neither of these beaches offers attractive swimming conditions. Both are exposed to the direct assault of waves from the open ocean and subject to strong currents and periodically high surf.